Americans love their pets, and they aren't afraid to open up their wallets to take care of them. Americans spent close to $60 billion on pet expenses during 2014, according to estimates from the American Pet Products Association. Between food, veterinary care and other supplies, it's easy for costs to add up. As the dog days of tax season approach, one question that many people have is whether there's any way they can get any sort of tax break for their pet expenses. As outlandish as it might sound, there actually are some perfectly legal tax deductions you can claim from what you spend on your pets. Before turning to those deductions, let's first take a look at what you can't do with pet expenses. The most obvious tax break that might tempt you is the personal exemption for dependents, which on your 2014 return will give you a reduction of $3,950 on your taxable income. Certainly, your dogs, cats or other pets rely on you for their survival. But the Internal Revenue Service takes the view that only human dependents can qualify for the valuable personal exemption. Several other similarly enticing deductions also don't work. Veterinary care might cost you as much as a doctor's visit for yourself, but you're not allowed to deduct those vet charges as medical expenses on your tax return. Similarly, if you're traveling on business, you can't write off the costs of boarding your dog in a kennel as a travel expense. Pet medical care isn't deductible, but if you need a guide animal for your own health, the expenses of keeping that animal become eligible medical expenses. Those costs include food, veterinary care, grooming and other expenses that the guide animal needs to give you assistance. In addition, therapy animals can also qualify, as long as you've received a medical diagnosis for a condition for which you need the animal. Keep in mind, though, that you'll need to overcome the special threshold for deducting medical expenses -- 10 percent of adjusted gross income for those under age 65 -- before you can deduct guide-animal costs. The IRS has allowed taxpayers to deduct expenses for guard animals protecting business property. Watchdogs are prime candidates for this deduction, as long as the dog is of an appropriate breed and you can document your expenses and the amount of time the dog spends on guard duty. If you move, you can deduct special expenses of moving your pets as long as the overall move qualifies for moving-expense deductions generally. Typically, the move has to be for work purposes, and your new job has to be at least 50 miles further away from your previous home than your old job was. If you qualify, the deduction is available even if you don't itemize, although a special form is necessary to claim the deduction. Many animal shelters are nonprofit organizations, so if you agree to provide a pet a foster home, you might be able to write off some of your expenses as charitable donations. In addition to pet food, vet bills, and supplies, you can also get a modest write-off for vehicle mileage. However, be sure to keep good records and get an acknowledgement of your work from the shelter in question, or else the IRS might challenge your claim. Some pet owners are able to turn their love of animals into a moneymaking profession. Whether it's racing horses, showing dogs or breeding animals of all sorts, you might be able to count some or all of your pet expenses against the income they generate. A lot rides on whether you're considered to have a business or merely a hobby. Hobby losses are deductible only to the extent you have gains, and you have to treat hobby losses as a miscellaneous deduction, which can limit the amount you can actually claim. The hurdle for establishing a legitimate business is higher, but you may be able to deduct all of your expenses for a business, even if it results in a net loss. Every situation is different, and you should work with a tax professional before claiming any of these expenses in your own specific case. 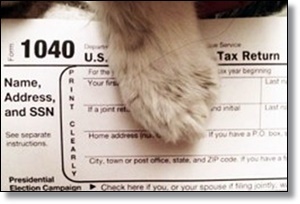 Nevertheless, if any of these situations applies to you, you might be able to turn your pet into a nice tax break come April.